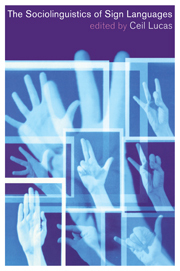 In sign languages of the deaf some signs can meaningfully point toward things or can be meaningfully placed in the space ahead of the signer. This obligatory part of fluent grammatical signing has no parallel in vocally produced languages. 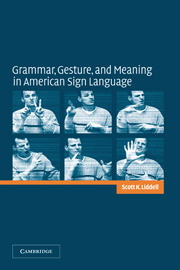 This book focuses on American Sign Language to examine the grammatical and conceptual purposes served by these directional signs. 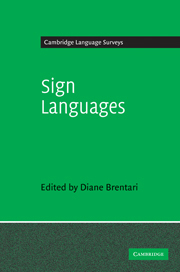 It guides the reader through ASL grammar, the different categories of directional signs, the types of spatial representations signs are directed toward, how such spatial conceptions can be represented in mental space theory, and the conceptual purposes served by these signs. The book demonstrates a remarkable integration of grammar and gesture in the service of constructing meaning. 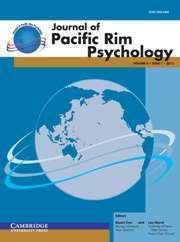 These results also suggest that our concept of 'language' has been much too narrow and that a more comprehensive look at vocally produced languages will reveal the same integration of gestural, gradient, and symbolic elements. Scott K. Liddell is Professor of Linguistics and Program Coordinator for the Linguistics Program at Gallaudet University, Washington DC. 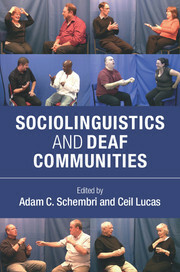 His publications include American Sign Language Syntax (1980), and he is also the author of nearly 40 articles and chapters relating to sign language grammar and the use of sign language in educating deaf students.